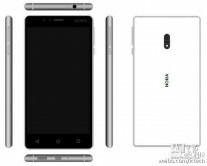 The Nokia brand is slated to return to the phone market this year with feature phone offerings from FIH Mobile and “at least” two smartphones by HMD in Q2 next year. Could this be one of them? 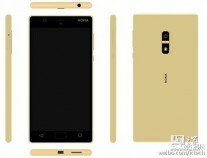 A post on Weibo alleges to show the metal back of an unnamed Nokia handset. And with size reference we can say for sure this isn’t the 13.8” Nokia D1C tablet. Little is known about the phone, but the metal back piece seems to match these renders that show a completed device. The renders show that the two holes are for a camera and a flash. There are two card trays on the left, a USB Type-C (probably) port on the bottom and a 3.5mm headphone jack. Of course, the author of these renders may have taken artistic license. There are three colors: Gold, White and Black. Notice how only the Gold one has a physical Home button (and reportedly a fingerprint reader). This points to two separate versions - regular and Pro maybe? 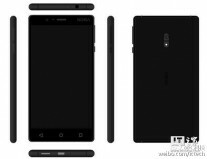 Concrete specs are unknown at the moment - the D1C runs Android 7.0 Nougat so the phones should too, but we hope they avoid the tablets low-end Snapdragon 430 chipset.